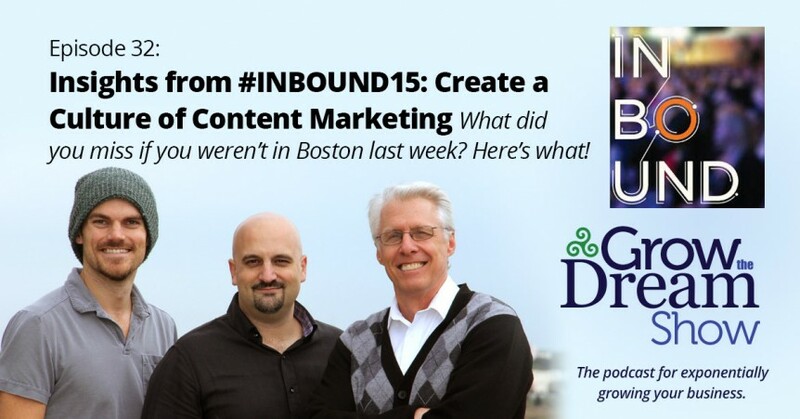 David and Josh were at #INBOUND15 in Boston with 14,000(!) other marketers and mined a wealth of insights that they barely get started on, such as: the biggest detriment to successful content marketing is a lack of buy-in — making it part of the company culture. And on that point are some amazing examples of success, from appliances to Mini Coopers. We were thrilled to be involved in HubSpot’s INBOUND Conference in Boston. Next year’s event will be held in Boston in November! A HUGE shoutout to @NoemiKrause for bringing us chocolates all the way from Switzerland! Thank you, Noemi… best of luck to you! We referenced our episode featuring Marcus Sheridan. If you haven’t heard it yet, you’re missing out! Josh published his notes from “The Top 10 Social Media Advertising Hacks of All Time!” by Larry Kim on Medium. David published his notes from “The 30-Minute Marketing Plan: Eliminate the Five Most Common Challenges With Executing Inbound Marketing” by Eric Keiles on Inbound.org. “Hi” to our newest listener!